Open the pages of the 1929 Mechanic Falls High School ‘Pilot’, the Maine school’s yearbook, and you’ll find the usual photographs of students with lists of their accomplishments and extracurricular activities. Turn to page 7, and you’ll find the photograph of one ‘Marguerite Frost’. She stands out. Her list of accomplishments is twice as long as anyone else on the page. During her high school years, Marguerite was involved with the Student Council, served as Class president and Editor in Chief of the Pilot, competed in basketball and debate, was part of the school Drama Club, and after all that, was Valedictorian. She was busy. It’s also worth noting that she graduated at age 16. Shortly after graduation, Marguerite went to work for Judge Edward Parent, first as a secretary, and later as a legal apprentice. While she had originally taken the job as a way to pay to attend a teacher’s college, Judge Parent prompted Marguerite to pursue a career in law. In 1937 Marguerite passed the Maine Bar Exam, one of the youngest people to do so, and one of only a handful of women lawyers then operating in the state of Maine. Marguerite practiced law, often operating out of her home, for most of her professional life. She also worked as a secretary at Bates College, and taught law at Bliss College, both in Lewiston, Maine. Over the years Marguerite would also work as the secretary of the Androscoggin County Bar Association, and serve on the executive boards of Lewiston-Auburn Child and Family Service Association, Child and Family Mental Health Services and Tri-County Mental Health. She was also an active volunteer with the United Way and the chairwoman of the flower committee at the local United Baptist Church. Here is the frustrating part: None of this is reflected in her home movies. Marguerite clearly loved her family, and took great delight in filming them. And, in keeping with the theme of the ‘Woman Behind the Camera’ project, Marguerite rarely hands the camera off to someone else to appear herself on film. 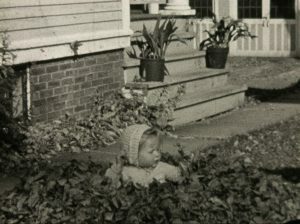 There are scenes of children playing in the yard, visiting relatives, and family vacations. Marguerite’s professional accomplishments go unrecorded. The camera itself might be a hint to the family’s dual-income. 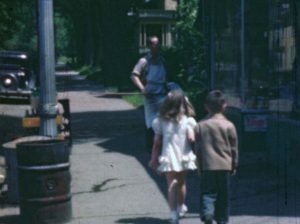 A family that could afford to film in color in the 1940s was probably doing pretty well. The family also appears to have a fair amount of leisure time, with multiple scenes of the extended family gathered at Sabbathday Lake, not far from their home in Lewiston. We also see lots of scenes of Marguerite’s husband playing with their children. Marguerite married Lionel “Lee” Larock in 1939. The couple would go on to have four children; Marcia, Dennis, Norman and Cynthia. 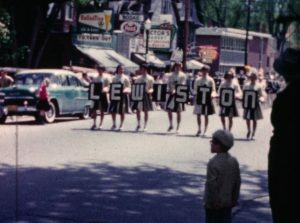 Lee ran several businesses, including ‘Lee’s Variety’ in Lewiston. We see the storefront in several of the films. 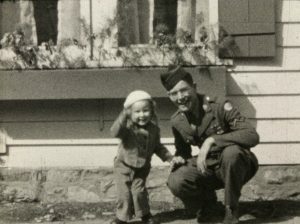 Lee, and Marguerite’s brothers Raymond and Vernard Frost would all serve, and all return, from Europe during World War II. We see the men in uniform, both before and after the war. The collection was donated with viewing notes from the original log book that accompanied the films. The notes provide a lot of information about the dates, locations and events featured on the film. They also include some rather adorable, voice-over style commentary from Marguerite’s children. 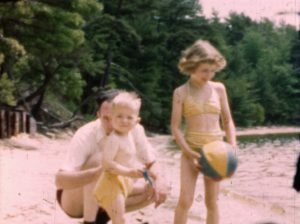 The Marguerite Larock collection highlights the important role outside documentation can play in regards to home movies. It provides greater information and context. Marguerite’s films provide a window into how she saw the world. 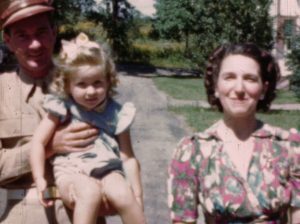 The written commentary provided by Maguerite’s children, and her obituary written by the family, show Marguerite’s life, not only as she filmed it, but also from the perspective of those who knew and loved her. The aforementioned yearbook pages, shared on classmates.com, show a woman who was very driven from an early age. A copy of Marguerite’s Notary Public certificate, held at the Bates College Archives, hints at her professional life. There may be other records we have not found yet. Without these additions, much of Marguerite’s life both in and outside the home would have been obscured. One of the great aspects of this grant is having the time and funding to pull together all of these scattered resources. It allows us to create a more complete picture of the world in which our filmmakers lived. 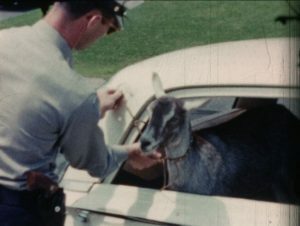 However, I have yet to find anything that tells me the proper context for this image of a goat in the back of a police car.